The weather out there today is rainy and smoky with continued rain and smoke in the afternoon. Tomorrow a chance of continued smoky skys with a weather front coming down from the north. The Pope election will be continued at about 9:00 a.m., if necessary with two ballots in the morning and two more in the afternoon. 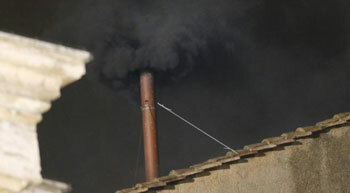 The Cardinals held their first ballot on Tuesday to elect a new Pope, with black smoke signaling no winner on the first day of their conclave inside the Sistine Chapel. Black smoke rose into the evening sky over the Vatican as a conclave of Cardinals failed to select a new Pope on its first vote Tuesday. Thousands gathered in St. Peter’s Square to watch the results, but trickled quietly out of Vatican City shortly after the black smoke rose around 8 p.m. local time. The outcome of the first ballot was expected, since all 115 of the Cardinals are theoretically candidates, and the winner must receive two-thirds, or 77, of the votes. The election will continue on Wednesday, with with ballots each in the morning and afternoon. Shortly after 4:30 p.m., time had come: accompanied by the singings of the Holy ,the 115 voting Cardinals moved into the Sistine Chapelon for the election of the 266. Pope. 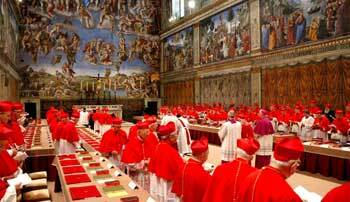 After the oath of secrecy, all except the voting Cardinals left the chapel. The doors of the Sistine Chapel were closed at 5:35 p.m., by the Master of Ceremonies Marini. A first round of voting on Tuesday was considered likely. If this is the case, the smoke signal is expected at about 7:00 p.m. The Vatican has launched a new service on its website: During the times when white or black smoke is to be expected, a video stream from the chimney of the Sistine Chapel will be available. The Vatican television service CTV has installed its own camera at about 10 yards distance from the chimney. After each of the two rounds of voting in the morning and afternoon, there will be a smoke signal, which should occur at about noon and 7:00 p.m.. In case the new Pope was elected in the first or third round of voting, the signal with white smoke for the successful election is given immediately. This would be around 10:30 a.m. or 5:30 p.m..
With a solemn mass in the St. Peter’s Basilica, the Cardinals geared up for the Conclave to elect a new Pope. In the “Missa pro eligendo Romano Pontefice” the Church dignitaries prayed for the assistance of the Holy Spirit for the decision on the head of the Roman Catholic Church. In the afternoon they then will adjourn to the Sistine Chapel, where the election Benedict XVI’s successor will take place in a closed session. 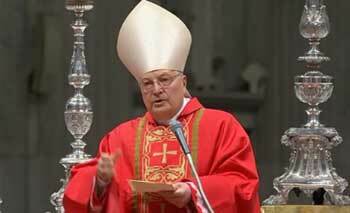 The 85-year-old German had resigned in late February as the first Pope in nearly 600 years. Dean of Cardinals, Angelo Sodano, called on God to help them make the right choice: “We implore the Lord, that through the pastoral solicitude of the cardinal fathers, He may soon grant another good shepherd to his Holy Church. In this hour, faith in the promise of Christ sustains us in the indefectible character of the Church.” He also called up for the unity of the Church, which has been shaken by numerous scandals in recent years. The last Mass before the Conclave in 2005 April, was led by the then prefect of the Congregation for the Doctrine of the Faith, Ratzinger, who came out of the Conclave as the new Pope. Ratzinger’s sermon was like a preview to the theological orientation of his pontificate. “Venerable Brothers, after having celebrated the divine mystery, we now enter into Conclave to elect the Roman Pontiff. The entire Church, joined with us in prayer, constantly calls upon the grace of the Holy Spirit, to elect from among us a worthy Pastor of all of Christ’s flock. With these words, once the mass “Pro Eligendo Romano Pontefice” (“For the Election of the Roman Pontiff”) is over, Cardinal Giovanni Battista Re will invite all those Cardinals elegible to vote, to proceed to the Sistine Chapel, where the Conclave will take place. The ballots have been printed and cut, the two stoves have been installed, and the chimney has been put in place. 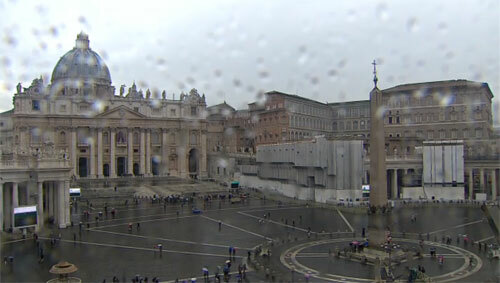 The Conclave officially starts at 5:00 p.m. – after prayers, the Cardinals will hold a first vote. The election of a new Pope starting on Tuesday is expected to be only a short procedure. Vatican spokesman Federico Lombardi told the ANSA News Agency the election process could be over “very quickly”. Observers expect a relatively short Conclave 2013. The Roman newspaper “La Repubblica” reported on Sunday, that many Cardinals expected that a new Church leader would be found soon. 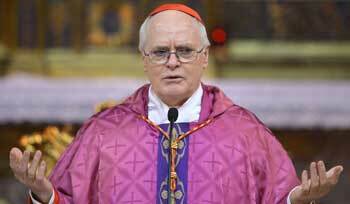 With four daily ballots, the Cardinals want to elect a new pontiff in the upcoming conclave. On Tuesday evening, the opening day, a first vote is already scheduled, in accordance with the electoral code. “With four rounds per day, it is easy to orient the votes on those candidates who can unite the strongest consent on themselves,” Lombardi said. As of Wednesday, the 115 electors want to cast a vote twice each morning and afternoon. If the ballot fails, the second followes immediately; afterwards, the ballots are burned along with a dark smoke cartridge. This should be the case each day around noon and 7:00 p.m., Lombardi announced reported. Once the election was successful, the notes will be burned immediately with a white smoke cartridge. As spiritual leader of the largest Catholic city in the world, Cardinal Odilo Pedro Scherer has an important position, that makes the Latin American one of the favorites for the Papal Office. The Cardinal of the largest Catholic city in the world, is traded not only in Latin American media, but also in the Italian “Repubblica” as “Papabile”: The name Odilo Pedro Scherer (63), since 2007 Archbishop of Sao Paulo, is found in all favorites lists as potential top candidate of the Conclave. The eloquent Cardinal from Brazil is regarded as very well networked and has strong backing in the Vatican. He belongs to the conservative wing of the Brazilian Church, but from a European perspective, he could probably pass as a moderate conservative. Odilo Pedro Scherer was born on September 21, 1949, in the State of Rio Grande do Sul as one of eleven children. His ancestors migrated in the 1880s from the Saarland (Germany) to Brazil. The dignity of being a Cardinal was virtually predestined: His uncle Alfredo Vicente, who died in 1996, was the Archbishop of Porto Alegre and also Cardinal.